The subreddit on foxes credits this tweet as the potential origin of the foxtato meme — the result of a sort of mash-up of work by other artists. If anyone knows the original artists, please connect us. 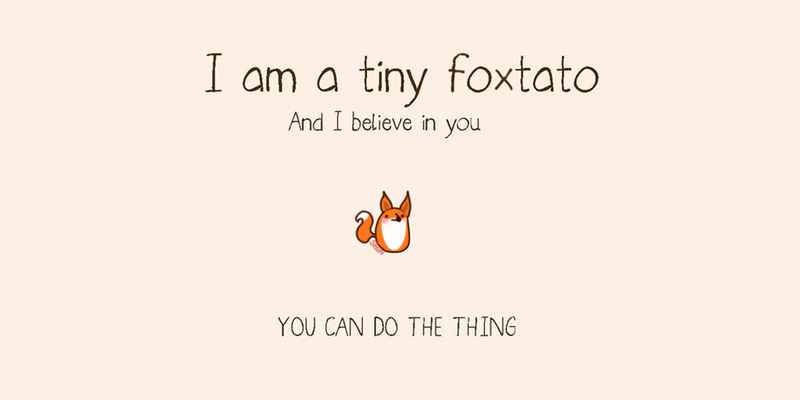 I’d like to hug the creators of the foxtato. I first met the foxtato in the summer of 2015 when someone important in my life texted the meme to me — I instantly fell in love. I printed it out and taped it to my monitor at work. I printed out two more copies and quietly slipped them onto the desks of our CTO and Head of Product. Within a week, the foxtato had infiltrated the company. 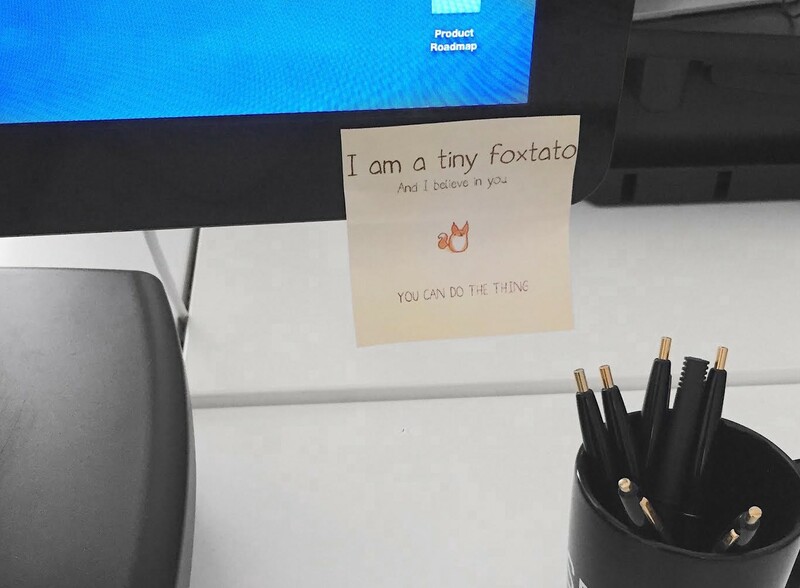 A tiny foxtato emoji showed up in our company chatrooms. The language of the foxtato started popping up in regular workplace conversation (“Are we ready to push that build to production?” “Yes, we’re ready to do the thing!”). I guess it made sense — our team is big on execution and getting sh*t done, but we also support one another and have each other’s backs. 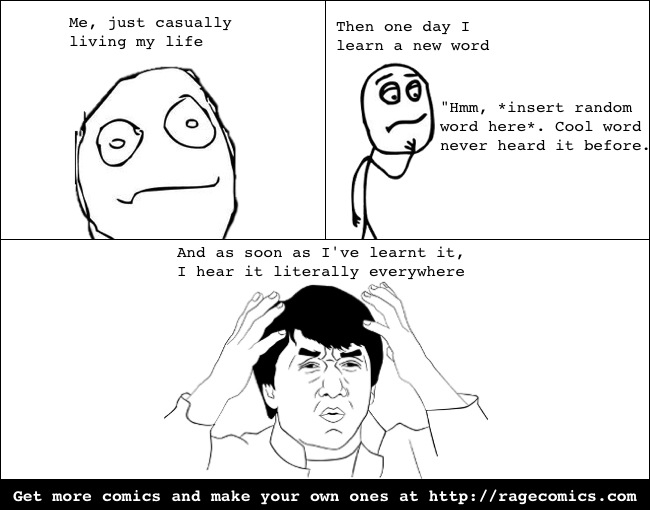 It was fascinating to see this silly internet meme become a mascot for some of the values we already lived at Reserve. It’s no surprise that when it came time to articulate all our company values, the message of the foxtato played an important role. Reserve always had values, but it wasn’t until about a year in that we realized we needed to write them down. We’d grown quickly since launching in the fall of 2014. In less than a year, we expanded to 7 cities and more than doubled the team to a staff of over 60. Maintaining a fast-growing, distributed team is nearly impossible without a strong company culture, and the executives who’d been with Reserve since the beginning (CEO Greg Hong, CTO Craig Coffman and I) took things like values — and foxtatos — very seriously. We wanted to get everyone involved. We knew that values couldn’t be a list of buzzwords for executives to force upon the team. If our values were anything less than an authentic expression of what it actually means to work at Reserve, they would be meaningless. We were inspired by a First Round CEO Summit talk by Jeff Lawson about the great work he did at Twilio to codify his company’s values, and we kicked off a project last fall to articulate our own. The result was The 10 Things, a collaborative, all-hands approach to articulating and breathing life into the values we were already living at Reserve. We distributed a simple survey to the entire company, giving all our employees, new and old (even those who’d recently joined us through acquisitions), the opportunity to share two values they already saw in their day-to-day at Reserve and wanted to encourage in the future. After collecting all this feedback, we started the process of boiling it down to a set of agreed-upon values. I printed out all the recommended values onto physical slips of paper, laid them out on a conference room table, and read every single submission. I was struck by motifs that came up repeatedly and started grouping the submissions into general themes. For example, many team members suggested different versions of “do the thing” or “get sh*t done” in reference to the theme of execution. I collected the results into a document to share with a larger group. We wanted representatives from all across the company to have a hand in crafting our values, not only because their diverse ideas help to make our values better, but because they could each serve as ambassadors for the values when it came time to roll them out. We used random number generator (can you tell Greg and I are Excel nerds at heart?) to select a 15-person Values Steering Committee that included diverse employees representing different functions, cities, seniority levels, genders and hiring paths. The steering committee first assembled in small groups of 5, allowing for all voices to be heard in a conversation. The groups were presented with the larger themes and given time to read through the anonymized submissions of their peers. Passionate discussions naturally followed about what resonated and what didn’t. Had we missed anything? Did anything feel off? Were there ideas that could be combined or others that needed to be teased apart? I took notes as a facilitator, and after the first round of discussion, the kernels of Reserve’s values started to take shape. We started with comprehensive feedback from across the company, but we didn’t want our values to manifest as a daunting tome that would sit on a shelf collecting dust. We wanted our values to be alive, to be physically present in our workplace. So we concentrated our values into snackable phrases that we could actually live. Drawing from Jeff’s experience at Twilio, we focused on human, actionable language that everyone could understand. Each of Reserve’s values is 3–4 words and, with one exception, starts with an action verb. Rather than “Operate with Integrity,” we say Don’t Be Shady. We avoid “Promote Knowledge Sharing Best Practices” in favor of Share the Wheel. Instead of “Perpetuate a Collegial Corporate Culture,” we prefer Share Your Sandwich. With a first draft of our values written in language real humans could understand, the full steering committee reconvened to give feedback. Some themes got the boot, and others were wordsmithed (One Team One Dream actually came out of one of these discussions). At the end, we had unanimous agreement that the committee had identified 10 values that accurately represented what being part of the Reserve family was all about. 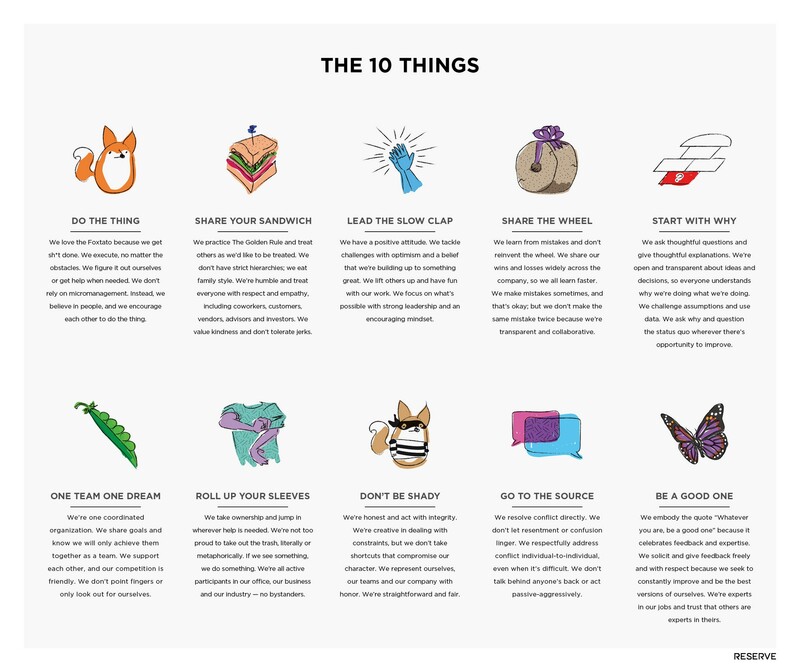 With a nod to the foxtato’s instruction to “do the thing,” we opted not to title them “Reserve’s Company Values” and instead affectionately call them The 10 Things. The power of the tiny foxtato to elegantly embody our reverence for execution and excellence inspired us to create foxtato-like icons for the rest of our values. I worked with our in-house design team to embody each value with a tiny, illustrated mascot. The icons for some, like Share Your Sandwich, were a slam dunk, but others required a little creative thinking. For example, Be a Good One is about encouraging a culture of feedback where everyone seeks to be the best version of themselves. After a few iterations, we choose a butterfly to represent that process of transformation and improvement. We tried to keep the illustrations as simple as possible with bold, primary colors. And because these values are meant to represent us all, we thought it would be cool to use abstract skin colors for our icons that include humans. 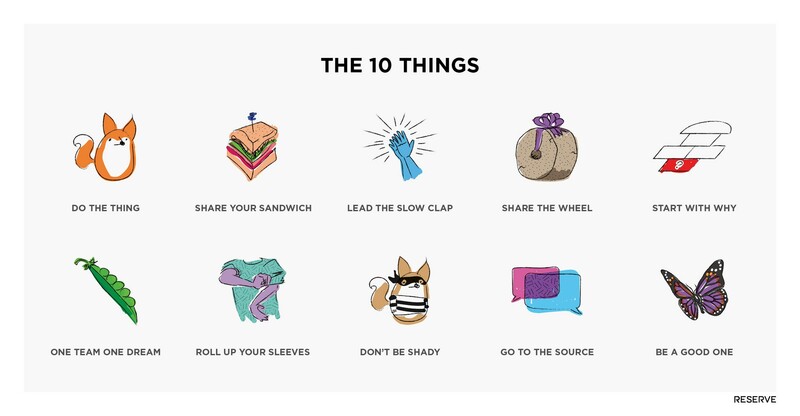 When it came time to unveil The 10 Things at a company all-hands meeting, it was a member of the steering committee who presented each value to the team. In addition to sharing the value and reading the official description, each presenter shared a real-life example of that value in action — something they’d seen recently at the company. Some stories were funny, others were touching, all of them were entertaining, and they served to breathe life into The 10 Things. They weren’t just words on a page, but a true representation of all the good things already happening at Reserve. After The 10 Things were unveiled, everyone was free to run with them. 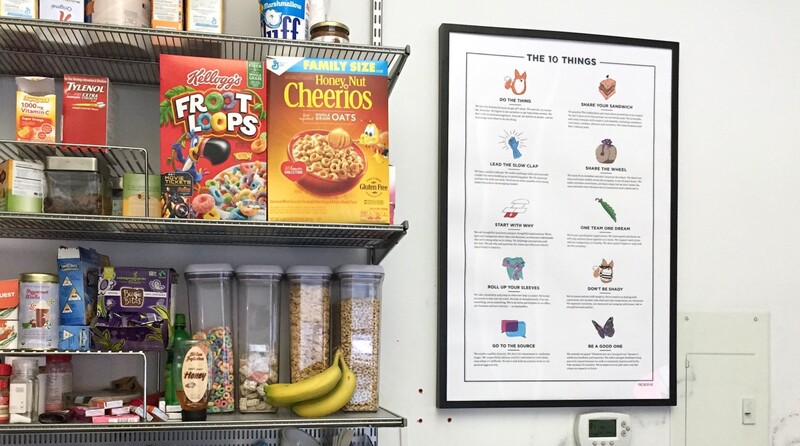 We created Slack emojis, made images and gifs widely available to the team on Google Drive, printed posters for all our offices, and encouraged employees to call values out by name when they saw them in practice. Sort of like when you learn a new word and then start hearing it everywhere, clearly articulating these values allowed us all to see them in practice much more clearly. Reserve’s values have always existed, but having a shared language to identify them only makes our values more salient, reinforcing them every day. In addition to living our values, we’re starting to build them into the way we hire and develop people. We’re beginning to incorporate The 10 Things into our recruiting process, and we’ll eventually make them part of our employee performance reviews. …and by the foxtato. He helped, too. This post is adapted from my talk on stage at the LAUNCH Festival in San Francisco on March 3, 2016. Like it? Click the little green heart below. Love it? Ready to do the thing? Join our team.